Team President’s X-Men and Fish N’ Fins Hunters showed composure as they survived and beat respective rivals, Wednesday night in the ongoing 2014 season of the Rudimch Enterprise Government/Business League at the Palau National gym. The President’s X-Men held on as they managed to fend off team ABC, 79-78. The X-Men started slow as they trailed 17-19 in the opening frame but managed to get their rhythm back in the second as they outscored team ABC with a 22-19 run to close the first half of play with a 39-38 lead. From there it was a close match but the President’s X-Men found their shooting touch as they went all the way for the win. Douglas Schmidt Jr. led the scoring chores for the X-Men with 35 points as Mekeruul Ueki chipped in 15. Kris Kitalong and Jaques Stills, on the other hand, topscored for team ABC with 14 and 13 baskets, respectively. 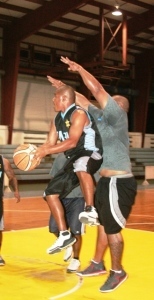 Meanwhile, Fish N’ Fins Hunters managed to stand their ground as they defeated the Palau Royal Resort (PRR) Dragons, 73-70. The Hunters were trailing 10-21 in the opening frame but managed to stage a comeback as they spurted a 21-12 run in the second canto to cut the lead at 31-33. Then the pushed themselves in the third as they outscored the Dragons with an 18-11 run to gain the lead at 49-44. From there, the Hunters never back down again as they went all the way to score the win with Moses leading the way with 24 while teammates Castro and Erwin contributed 14 and 11, in that order. Brian Labrador finished the game for the Dragons with 18 baskets while gunner Gener Aguinaldo clipped 14 on the losing end. In other games, PPUC Electric Eel drubbed team Malii, 92-48; Neco beat Island Rhythm, 86-70; PPR Shark Attack beat WCTC Powerball, 78-71; and Mason’s Mercury bested SDA Crusaders, 88-76. Games will resume tonight with MOJ Lawmen versus PPUC Electric Eel at 6 p.m. while MOH Band Aid will face President’s X-Men in the main game at 7:30 p.m.
Monday night games will feature MOF Omsangel against MOJ Lawmen at 6 p.m. followed by the Team ABC-PPUC Electric Eel match at 7:30 p.m. while Neco will face Mason’s Mercury in the night cap at 9 p.m. Team coaches, managers and team representatives are reminded that there will be a technical meeting on September 8 (Monday) at 11:30 a.m. at the PNOC Conference Room. Attendance is a must.